One occupational hazard of reviewing manga is the powerful sense of déjà vu that a middle-of-the-road series can induce. I experienced just such a flash while reading Kakuriyo: Bed & Breakfast for Spirits, a pleasant, decently executed shojo series that hit so many familiar beats I was tempted to pull out a bingo card and tick off the stock characters and situations as I plowed through volume one. As in other supernatural romances — think InuYasha and The Water Dragon’s Bride — the plot is set in motion by the heroine’s abduction to the kakuriyo, or spirit realm. There, Aoi learns that her late grandfather was capable of traveling between the kakuriyo and utsushiyo (human world), a skill that gramps exploited to run up a tab at a supernatural B&B. Gramps pledged Aoi as collateral, promising her hand in marriage to Odanna, the inn’s proprietor. Odanna is — wait for it — a handsome jerk with an attitude so condescending that Aoi can barely stand to be in the same room with him. Indignant at the prospect of marrying an ogre, Aoi instead vows to settle her grandfather’s accounts by working at the inn — a vow made more complicated by the other demons’ refusal to hire human staff for even the most menial tasks. 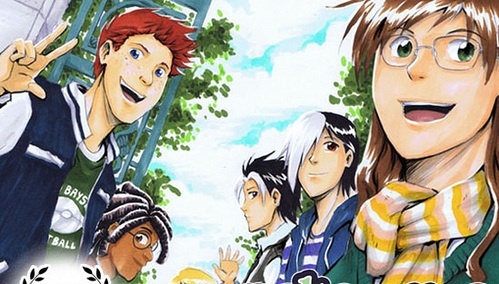 In a nod towards current publishing trends, the creators have used Aoi’s predicament as an opportunity to graft elements of a cooking manga onto the main plot. Aoi makes her first demon ally through a savvy demonstration of her culinary skills, for example, wowing him with omelet rice and chicken stew. The inclusion of these scenes feels perfunctory, however, as they add little to our understanding of who Aoi is; if anything, these interludes serve mostly to foreshadow the inevitable moment in volume two or five when Aoi finally persuades the inn’s demon chef to modernize his menu with Japanese comfort food. Yet for all the joys of seeing the Night Parade of 100 Demons come to life in such a stylish fashion, I was so aware of the plot mechanics that I could never fully embrace Kakuriyo as a story. Someone less steeped in the conventions and cliches of shojo manga, however, might well find Kakuriyo a charming introduction to one of the medium’s most ubiquitous and appealing genres: the supernatural romance. The verdict: Librarians working with middle school readers might find Kakuriyo a good addition to their graphic novel collection, as it’s largely free of provocative content (e.g. strong language, sexuality) but will feel more “adult” to readers in grades 6-8 than other T-rated romances. A review copy was supplied by VIZ Media. 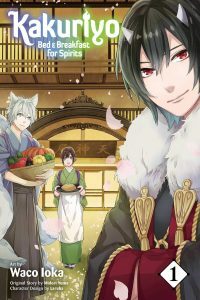 KAKURIYO: BED & BREAKFAST FOR SPIRITS, VOL. 1 • ART BY WACO IOKA, ORIGINAL STORY BY MIDORI YUMA, CHARACTER DESIGN BY LARUHA • TRANSLATED BY TOMO KIMURA • RATED T, FOR TEENS (FANTASY VIOLENCE) • 196 pp. If you’ve ever watched Iron Chef, you know that some competitors prevail by transforming the day’s theme ingredient into dishes of astonishing originality and complexity, while others win by making everyday dishes—say, mac and cheese or fish sticks—with such consummate skill that they elevate comfort food into cuisine. I don’t know what kind of cook Laurianne Uy is, but if I had to hazard a guess based on her writing, I’d say she fell into the second category of culinary magicians. Polterguys, her print debut, isn’t astonishing for its novelty, but for its masterful presentation of a familiar story. That story goes something like this: nerdy high school girl Bree seeks a fresh start in college. Bree soon discovers, however, that college isn’t the haven she imagined it would be. Her roommate is loud and messy, and her classmates are more interested in partying than studying. When presented with the opportunity to live on her own, off-campus, Bree jumps at the chance. The house she rents, however, is already occupied… by five male ghosts. And cute ones, at that. Polterguys also benefits from a tightly scripted story. Uy handles the exposition crisply, using an emotionally charged scene to frame the action: we meet Bree, watch her move into her college dorm, then see her collapsed, sobbing, in the rain several weeks later. The story then jumps back to the beginning of her first semester, showing us the sequence of events that led to that tearful moment. Though Uy covers considerable territory in her first volume, completing one character’s story arc and establishing another (presumably to be addressed in the second volume), the narrative never feels rushed; Uy steadily increases the dramatic tension, building to third-act climax that’s both sad and satisfying. Art-wise, Polterguys may remind readers of Dramacon and Nightschool — not because Uy’s style resembles Svetlana Chmakova’s, but because Uy, like Chmakova, employs an artistic vocabulary that’s a distillation of shojo manga conventions, rather than a slavish imitation. Uy’s character designs are a great example: though they’re heavily stylized and simplified, they owe as much a debt to Archie as they do to Ouran; the only obvious nod to shojo manga is embodied in a pair of twins who have a bad case of Manga Hair. (Both sport spiky, skunk-striped fetlocks.) In another departure from standard shojo operating procedure, Uy draws Bree as a slightly awkward, geeky figure — bespectacled and freckled, favoring Carhart pants over cute outfits — rather than a blandly pretty teen. The Polterguys with Bree (front right). Image copyright Laurianne Uy. Perhaps the best compliment I can pay Polterguys is that it’s an old story told well. Uy’s witty script and appealing characters leave a fresh impression, even when the plot itself does not; Polterguys is one of the most unabashedly fun new comics I’ve read this summer. Recommended. 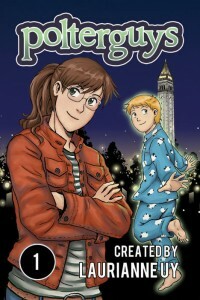 Where to Read and Buy: Readers curious about Polterguys can read the entire first volume at Laurianne Uy’s website. Thanks to a successful Kickstarter campaign and a 2012 Xeric Grant, readers who would like to own a copy can purchase PDF and paper copies through her website. Polterguys is also available through Amazon, Barnes & Noble, and the Apple Bookstore. Review copy provided by the artist.